A global insurer wanted to produce regulatory reports in-house instead of outsourcing to consultants. We were also asked to streamline all the client’s finance and accounting practices. Since the client operated in different geographies, a single team had to own all internal and external reporting and develop a standard accounting system for the entire organization. 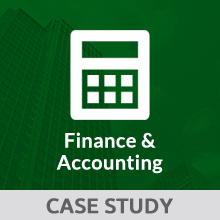 The client wanted to modify financial closing and accounting work by moving accounting records from Excel spreadsheets to the SunGard ERP platform, along with balance sheet reconciliations. We designed the closing calendar, defining timelines and assigning ownership to different stakeholders to clarify upstream and downstream processes and to share the accounting logic being applied. To achieve those objectives, Xceedance built an internal team comprising qualified accountants and subject-matter experts in finance with extensive experience in serving international organizations in the fields of accounting, U.S. GAAP, and regulatory reporting. We also partnered with the CFO to digitize the finance function, streamline and simplify processes, and establish benchmarks for better governance and regulatory compliance. Empowered by our progress with the accounting books, we took on regulatory reporting next. Since our data sources were manually prepared Excel spreadsheets, validating the accuracy of those sources was our chief challenge. In collaboration with the client’s accounts receivable and operations teams, we developed a reconciliation process to eliminate data leakage and to reconcile the sub-ledger with the ledger. We defined codes to knit regulatory reports with source data and created audit trails to detect any modifications to the source data. After achieving compliance with local regulations, we received the go-ahead on the reporting aspect of the project in just six months. Next, we undertook the accounts payable function. Data security was of paramount importance since direct access to bank accounts was involved. After meeting with the various business units to understand the exposure and the necessary controls while processing payments, we created process documents and control mechanisms that streamlined the AR function in less than three months. We also extended the client’s ability to manage accounting and reporting functions for new business entities in other geographies in less than six months. At last report, the client had realized 36 percent cost savings by the end of Phase 2. Last year was pivotal for our Asia Finance and Operations team. Xceedance contributed to the continuing build-out of the Asia platform by implementing new tools and systems, improving processes, and ensuring timely and accurate delivery to our local regulators and U.S. counterparts. The Xceedance team performed with the highest level of professionalism and skill.